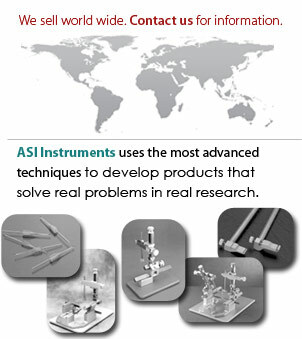 ASI Instruments designs and manufacturers world-class instruments for the Life Science/Biomedical Research community. We specialize in Animal Bed Handling Systems / Preclinical Imaging Instruments, Rodent Brain Matrices, and Stereotaxic Instruments. Today, ASI Instruments uses the most advanced techniques, and facilities to develop and manufacture an expanding innovative, patented, line of products. "Designed By Scientists for Scientists." Products that solve real problems in real research. Products that have earned the respect of the most demanding user in labs around the world. Products that set trends. Products that are backed by the best warranty in the business. "I encourage you to experience the difference for yourself."